There is one post tagged sushi. First of all make sure you buy one of those all-access railpasses in advance. It might be harder to get that done once you are in Japan. The high-speed trains are insanely efficient and traveling those long distances through (as one of my friends call it) “the most beautiful and the most ugly country in the world” using other means of transportation is a waste of your time. I did the following route in four weeks and absolutely loved it: Tokyo → Kawaguchiko → Mount Fuji → Kyoto → Hiroshima → Kagoshima → Yokushima → Nagasaki → Osaka → Naoshima → Kobe → Kyoto → Nara → Ise → Matsumoto → Tsumago & Magome → Kanazawa → Tokyo. Japan is mostly a cash-based society and it can be hard to find ATMs that work for you. If you have a VISA card then you can get money at any of the abundant Seven/Elevens. If you you only have a Mastercard then you have to find the larger post offices to get money out. Update: Apparently Maestro now works at Seven/Eleven too, so no more ATM issues then. Make sure to visit the different types of onsen. Occasionally you have them outside in nature and they can be wonderful. The first thing you should check is whether the Sumo tournament happens to be in Tokyo while you are there. If so, get tickets and go there for an afternoon. If you visit the fish market early morning, you shouldn’t go and stand in line at the sushi place that everybody seems to want to go to, go to ‘Ryu Sushi’ instead. They had the best sushi I’ve had in all of Japan. I thought that Akibahara (including the bizarre ‘French maid’-cafes) was a must-see and the tiny bars in Golden Gai were very interesting too. My best memories are of climbing Mount Fuji. I started around 13:00 all the way down at the first station and walked up to the top till 01:00 at night (with a small rest), in time to see the sun come up. It was far and cold, but worth it. I was very lucky to have one of the clearest nights of the season, and I am sure it can be horrible and disappointing too. I haven’t bought much stuff in Japan (I try to buy as little as I can in general), but I did buy a great kitchen knife (for the left-handed) at the kitchen-area in Tokyo and beautiful asymmetric earthenware for a few euros a piece (I should have bought more as they are my favourite things in my house now). I am still disappointed that I couldn’t get a ticket for the Ghibli museum. These seem to sell out weeks in advance. Everything is beautiful here and nothing disappoints. Two pieces of advice: Rent a bike, it is the ideal place to cycle around because everything is so close to each other; and go to the top floors of the ridiculously massive train station, you have wonderful views from there. Otherwise just go on a hunt for the small Zen temples. I thought that Koto-in was amazing and was hugely impressed by the Zen rock garden at Ryoanji. The manga museum did very little for me, but I am in no way a manga fan anyway. If I ever go back to Kyoto then I would try to go see the ‘Ninja house‘, as I didn’t manage that the first time around. If seeing this part of history is something that interests you, then Hiroshima is the place that has the most to offer. I was incredibly touched by the videos of the survivors telling their stories in the museum there. 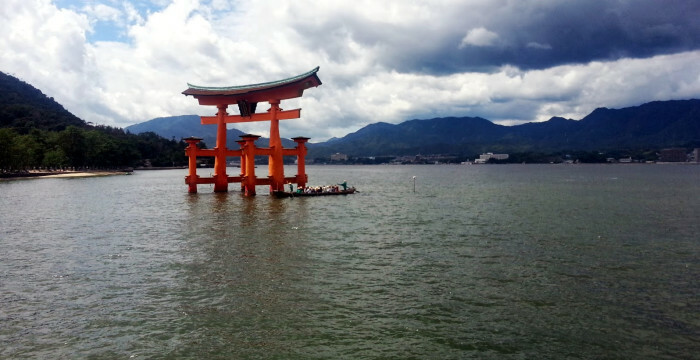 From Hiroshima it is a short trip to Miyajima (see the picture above) which is well worth the effort. Nagasaki is cool too: it has a small piece of Dutch history and has a very interesting fusion kitchen. If you go there, make sure to take the boat to the absurdly weird Gunkanjima. I thought this island all the way South was super. Apparently it always rains there, but I was lucky and must have caught the two days that it didn’t. The walk to the oldest tree in Japan through nature (following an old train track) was gorgeous. I slept at Lodge Yaedake Sanso which comes highly recommended. Can be skipped. I was there to go and see a yearly festival in one of the neighbouring towns. My best experience there was sleeping in a capsule hotel (Capsule Hotel Asahi Plaza Shinsaibashi, men and women separate). If you like okonomiyaki then Osaka is the place to go. For me this truly is a must-see. Try and sleep in one of the Mongolian yurts next to the water (Tsutsuji-so) and make sure you have enough time to see all the museums and art pieces. The architecture of the Chi Chu Art Museum literally made me cry (this Tadao Ando is brilliant). Make sure to take the ferry to Teshima, rent a bike with an electric motor and cycle to the Teshima Art Museum (which was missing from my edition of the Lonely Planet), it is utter genius, really. Naoshima was the one place where it was a bit hard to find decent food. Also you can skip the artsy public bath with the elephant. The giant wooden temple at Nara is impressive, but I could have done without it too. So if you are short of time, skip Nara. The story behind Ise is incredible. When I was there was just the time when they were rebuilding everything, but it is a far way out and there is little to see as an outsider. I thoroughly enjoyed walking for about half a day from one town to the other using this old Nakasendo postal route. It would have been nice to have been able to spend a bit more time camping along the same road that Musashi traveled. I had a superb meal and slept very well at the Fujioto Ryokan in Tsumago.